JEMILLA BAILEY, mother of a nine-year-old student of Tranquillity Government Primary School in Port of Spain, staged a silent protest outside the school yesterday, calling for the immediate removal of a male teacher who she claimed assaulted her son last Friday. Bailey claims her son was physical assaulted by the teacher after he was found standing on his seat in class. The teacher allegedly began beating her son with a stick before her son tried to grab the stick from him. Her son said there was a struggle and the teacher held him in a headlock while hitting him several times in the face. She says her son told her about the incident and on Monday she gathered support from other parents who had similar experiences with this teacher, to speak with the principal and the teacher. Responding to claims that her son instigated the confrontation, Bailey says she is not convinced he was the aggressor and has already filed an official complaint with the Ministry of Education. “I couldn’t believe the teacher did this to my son, so I asked him several times, to make sure he was telling the truth. “Then I found out that other parents have had similar experiences with this particular teacher. Bailey said she is awaiting the results of an investigation by the ministry and is prepared to take legal action if the teacher is not punished. Unless he was removed from the school, she said, students would continue to live in fear of victimisation for their parents’ actions. Newsday spoke to Education Minister Anthony Garcia, who is visiting the University of the West Indies’, Cave Hill campus in Barbados. He said he was aware of parents’ dissatisfaction and Bailey was well within her right to file a complaint with the ministry. In such cases, he said, the school’s principal was obligated to file a report to the line school supervisor, which would be forwarded to his office as minister, but he had not received any such report. 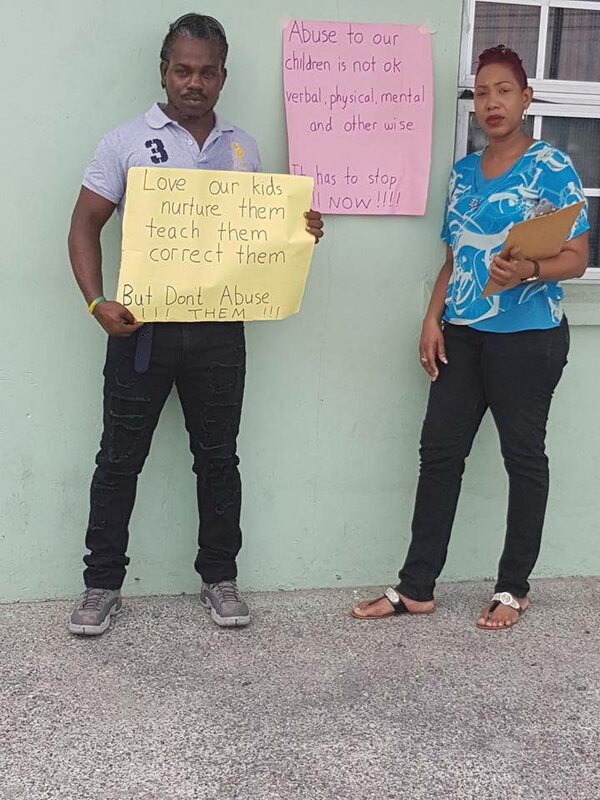 Jemilla Bailey the mother of a 9-year-old student of the Tranquility Government Primary School staged a silent protest outside the school this morning calling for the immediate removal of a male teacher who allegedly assaulted her son last Friday. Speaking with Newsday today, Bailey claims her son was the victim of physical assault by his teacher after he was found standing on his seat in the class. The teacher allegedly began beating her son with a piece of stick before her son tried to grab the stick from him. She said according to her son a brief struggle ensued and the teacher held the child in a headlock while hitting him several times in his face. She says her son brought the attention to her after school on Friday and on Monday she gathered support from other parents who have allegedly had similar experiences with the teacher to speak with the Principal and teacher. Bailey said she is currently awaiting the results of an investigation by the ministry, but said she was prepared to take legal action if the teacher was not punished for the alleged assault. She said unless he was removed from the school students would continue to live in fear of victimisation for their parents' actions. Reply to "Mother wants teacher removed"